His contribution to the Bengali novel is remarkable in one utterance. His novel type of writing is not like the other writers, each of his novels is different from each other for a little different and new type of events. He is Prafulla Roy. 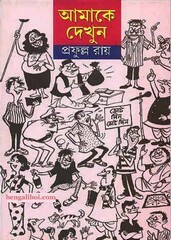 An Indian Bengali writer. His first novel 'Purba Parvati' in 1957. He has received many awards throughout his life for writing novels. Among them he got the Academy Award in 2004 for his notable novel- 'Krantikal'. Now I want to share a novel of this author- Amake Dekhun, there are four parts together in a pdf. The pdf has 602 pages with 33mb file size.